There are some of the most amazing stories of early Maryborough residents that are often never told. I grew up in the pocket and next door lived and old man and lady they were very quiet and she was a gentle soul. Everyday we as kids would see thebold gentleman wander through the garden in his backyard and gently wind his way through his vege patch touching every plant as he went. We thought he was showing his plants some tenderness to help them grow..which they all did to a magnificent size yet we were so wrong. You see the old gentleman was blind and the story begins with a young man called Percy Finney. The Telegraph 2/5/1933. BLIND ROWERPercy Finney’s Courage. Percy Finney, the blind oarsman, who is rowing three in the Queensland crew which will race in the Kings cup, has courage. It is probably the last thing that occurs to him, but to speak to him is to see how much courage he has. 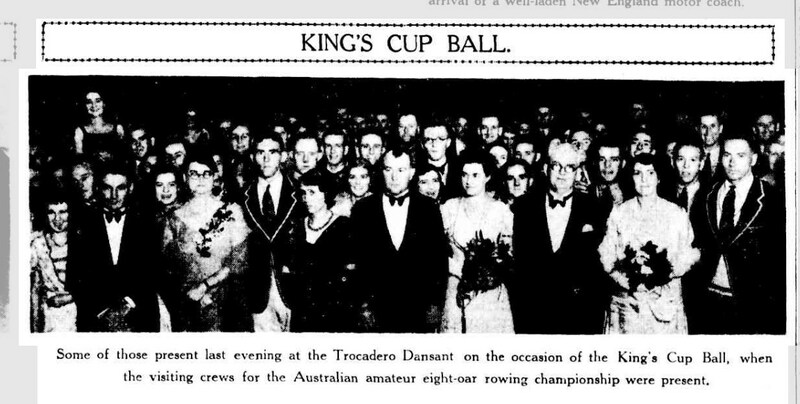 In 1924 he was rowing in the Wide Bay crew thatwon the Kings Cup. He returned home and a few weeks afterwards met with an accident while wallaby shooting. His sight was ruined. For a while he could distinguish between light and darkness; but now his world is black. But that has not been enough to break his spirit. He has been rowing for some years since he became blind, and now is in the state crew. There is not a modicum of self pity in Percy’s make up. in an interview he talked of the rowing world with more keenness that most men who can see everything. He knew where some oarsmen were weak and others were strong. He knew what the other crews were like, and every word he uttered showed his enthusiasm for the sport. Mr Finney said that after the accident his nerves went to pieces. To be unable to see anything; to have no knowledge of where his next step would take him upset him terribly. When he went down steps, he said, he trembled all over, and if he went to a boxing match he shook like a leaf. but all this was overcome. 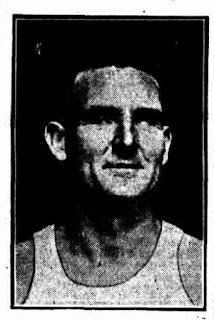 His first definite break was when he entered for a swimming race in the Mary River. His father rowed in a dinghy and Percy followed, and although he was left at the start he came second. He had not trained for the race either. But the real test of courage came when he recommenced rowing. One day, about six years after his accident, he was asked to go out in a four with someone. He said that he did not think he could manage it, but yielded to persuasion. He had his row not a very long one – and although he did not feel too comfortable, did much better than he thought he would. He was out of condition utterly and thought that he never would be ale to do a solid three miles again. When he got back to the pontoon, too, he felt unutterably giddy for a while, bu t in time that passed. Now he covers three miles with the best of them. “But how do you manage to keep the time and know what the crew is doing?” he was asked. “It must be worrying not to know how far you have gone,” it was suggested, but Mr Finney explained how this was overcome. And in the crew Percy Finney is as good anyone. He gets the timing; he rows hard, and he sits up straight. He is always there when the boat has to e put out of the water or put in, and does not shirk any duty. When he is rowing he asks for no concessions for his affliction. Finney’s inclusion in crews has no savour of sentimentality about it. He rows on his merits. This can be seen from some of his successes this season. He has rowed in the crew that won the champion fours of the Mary River; champion fours of the Burnett; challenge fours of the Mary; senior eights of the Mary and Fitzroy,and the champion eights of Queensland. Altogether he has three champion eights of Queensland to his credit. 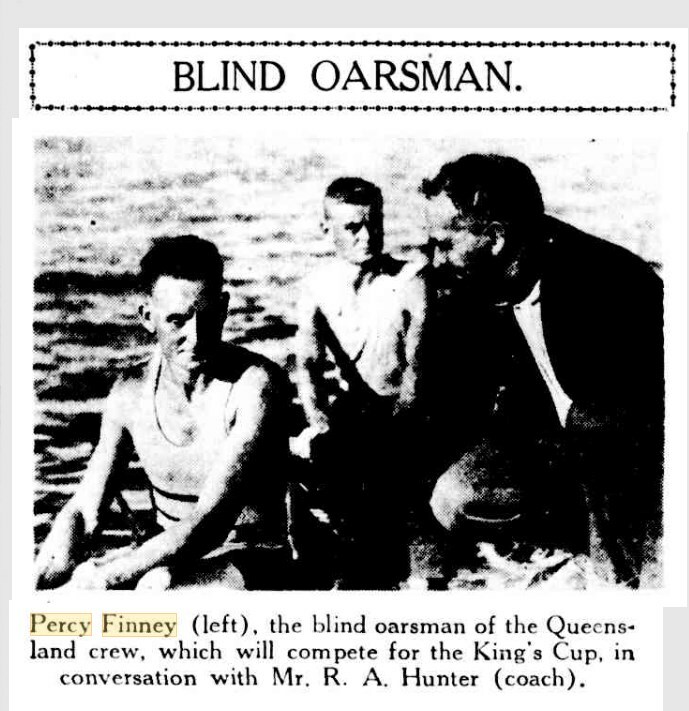 Finney certainly has courage, and everyone wishes hi success, for a man who although blind, has the pluck to row in a three mile inter State rowing championship against the best men in Australia, is well worth his salt. Apparently in 1924 Percy was out wallaby shooting near as they were known in those days the Waterworks. When his mate accidentally shot him, something like 30 pellets entered his head at short range, and unfortunately three entered one eye and two the other. The Maryborough community gathered around to raise money to assist Percy with his medical treatment but all the medical aid could not even recover the faintest bit of sight. 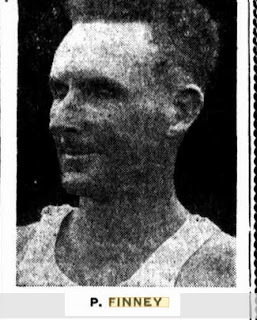 Even when Percy how stroked the Wide Bay (Q) crew in the championship fours at Bundaberg, heart the report of the gun and the outburst of cheering that signaled the end of the race, he didn’t know he had won the event for his home town, the rival city of Maryborough. Neither did he see the fluttering handkerchiefs of the gay crowds that thronged the banks and the river. Finney is totally blind having lost his sight when he received a charge of shot in the face from the gun of a companion who mistook him for a wallaby. Despite his blindness Percy was the happiest man on the river when No. 3 told him they had won. Percy Finney married Evelyn Sears and they lived a long life together and Evelyn died on the 8/7/1999 at the age of 98 years old and is buried in Maryborough Cemetery. Percy died in 1979 in Maryborough..
Leanne Wroe – Maryborough District Family History Society.